No matter who does what in space going forward, if it involves humans for extended periods, an understanding of variable gravity’s effects on humans and plant and animal life will be required. Mr. Driggers lays out the argument for a rotating environmental research facility in Earth orbit to simulate Mars working conditions (0.38g), lunar working conditions (.16g), and O’Neill free-space habitat working conditions (up to 1g). Such a facility is not possible on the ground and a bit moot if the rich and impatient throw all in for another planet without such grounding. No one knows, for example, if human or animal conception and gestation is even possible at less than 1g. Scott Kelly’s debilitating year in microgravity aboard ISS proves the need for a TESS (Test, Evaluation, and Simulation Station) in low orbit capable of 0-4 rpm to provide centrifugal gravity gradients from 0 to 1g. Driggers logically describes and illustrates such a station in the book. While NASA has forgone a centrifuge on ISS on the basis of cost (politics) and Elon Musk has, since the book was written, rolled out a “plan” to haul the masses to a 0.38g rusted rock without one, Driggers calmly and firmly stands on the call for TESS. For those of us non-scientists and non-engineers who were kids when we saw the film “2001: A Space Odyssey”, we knew intuitively, thanks to Kubrick, that rotation was necessary to make space work for us. Wernher von Braun knew it well. 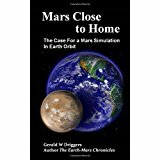 Mars Close to Home by Gerald Driggers, to buy it on Amazon.com, click here.